Inking on the Edge: My Favorite Things Stamps....New Product Tour...Pure Innocence-Surfer Dude! 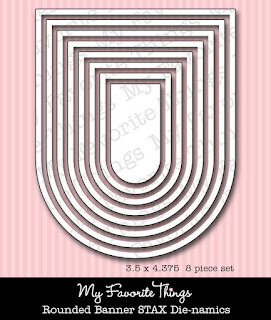 My Favorite Things Stamps....New Product Tour...Pure Innocence-Surfer Dude! YAY! It's time to shop, Stampin' friends! All the Brand Spankin' NEW Stamps and Die-namics are now available...but first check out the New Product Tour with us! I am featuring the NEW Pure Innocence, Surfer Dude. This PI Surfer Dude is absolutely adorable! I coloured him with my Copics and paper pieced his surf board and wet suit. I used this fun and vibrant papers from the PB&J BasicGrey 6x6 paper pad. 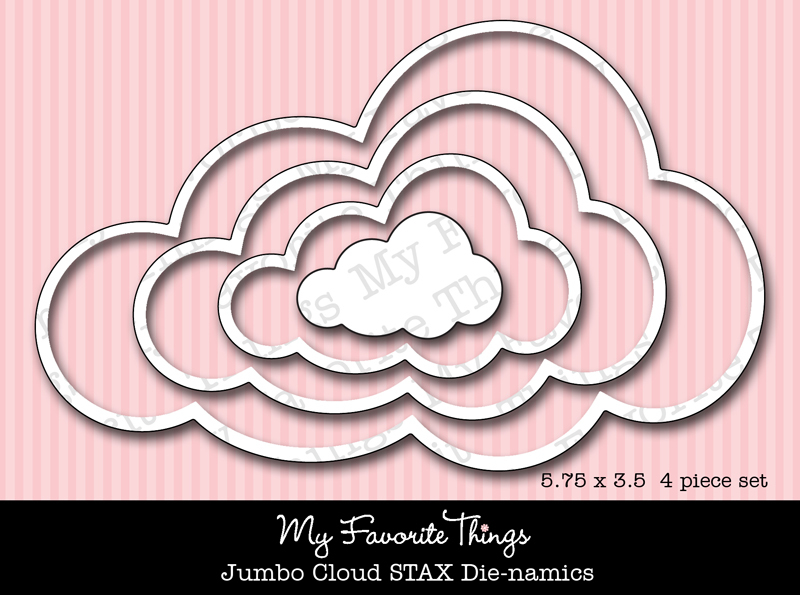 I also created a little scene using the fabulous NEW Jumbo Cloud STAX Die-namics and the NEW Rounded Banner STAX Die-namics. I cut the clouds from canvas material and then cut a second set from kraft card and backed the canvas clouds just to make them a little more sturdy so I could adhere them with po-dots to add some dimension. 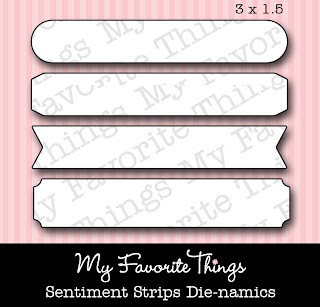 I tucked the little sun from the Notched Tag Stamps and Die-namics set in behind the cloud. 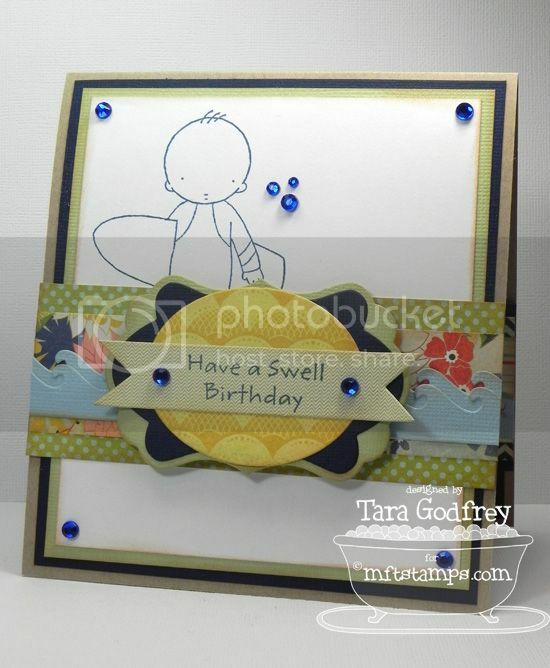 I also added some waves with the Catch a Wave Border Die-namics too. This set has the most radical sentiments and I stamped...my fave...Cowabunga on pattern paper cut with one of the NEW Sentiments Strips. Here is the inside of the card...I stamped the NEW PI Surfer Dude again, added a couple more waves with the Catch a Wave Border Die-namics and stamped another sentiment from the set on the larger of the two dies from the First Place Award Ribbon Die-namics. Well, thanks SO much for stopping by and having a wee peek at my card with the super cute NEW Pure Innocence Surfer Dude. Please take a moment to visit Kim's blog for links to all the MFT Designers with fabulous cards for the New Product Tour. Now it is time to SHOP at MFTStamps!!!! coooool card! love the clouds and that wee sun and his wetsuit and well, everything! 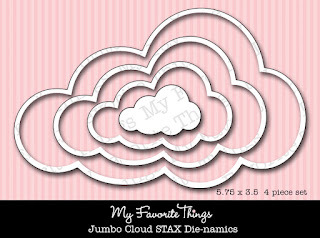 This is so darn cute and now that i've seen those clouds in canvas, you know I have to have them, lol. Love the card design and the image is so great. Tara, I just love your work! This is super cute! Great card. Love the clouds and all the detail. I like the pattern board! Whoa! Is that not the cutest card ever! Really clever design and textures! Fabulous artwork! Love your use of fabric in the clouds etc.! Really COOL!!!! Super cute!!! What a fun card! so many fun elements to look at! absolutely beautiful card, Tara, I love everything about it! You NEVER disappoint!! Love the canvas clouds and layers! The clouds add a wonderful effect. Love the canvas clouds. I am wishing I had ordered the surfing set. So many adorable projects, yours included, have been showcased! Love the fabric and layout - a brilliant make! wow! Love your use of dp. This guy is a real cutie. Gorgeous! I love your paper piecing. This is adorable. Love the way you did the clouds with the canvas fabric. Surfer Dude is just too cute. How cute!!! 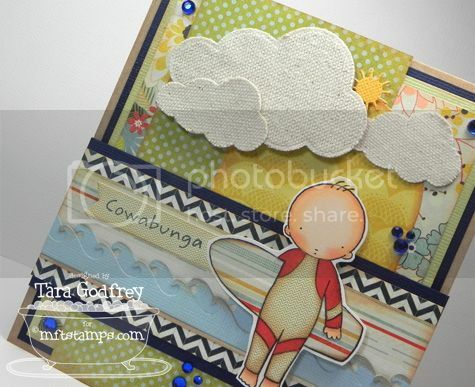 Love the clouds and the itty bitty sun=) Also love his wet suit...such great details to your card! Love your card.I must get this stamp set being from Hawaii, it's perfect. Your cloud are awsome and love the fabric you used to do them! Great card! I really love the bright papers! This is so adorable Tara! Love the surfer dude! Great card!! Amazing card and choice of papers. Great work! Tara, I love love the bling and surfer dude. SOOOO cute!!! LOVE the canvas clouds! Great idea!!! Wow! I love all the little details and embellishments on your card!! It is awesome! Love everything about your card. So many perfect details, especially the clouds. Super cute!! I love the clouds they really make a perfect scene. Fabulous!! !